The concrete bridge was constructed by unemployed returned servicemen to commemorate those who were killed in action during World War One. It was safely used as a refuge by women and children during the disastrous bushfires of 1939. The roadway over the bridge is now disused following construction of a new bypass road and bridge in 1973. 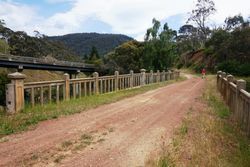 The Omeo Memorial Bridge was builtover Livingstone Creek on Alpine Road in memory of the First World War. It was designed by Omeo Shire Engineer C.H.R. Heale and built by the Country Roads Board in 1919-21 to replace an earlier timber beam bridge known as Connely's Bridge that was badly damaged by floods in 1916. 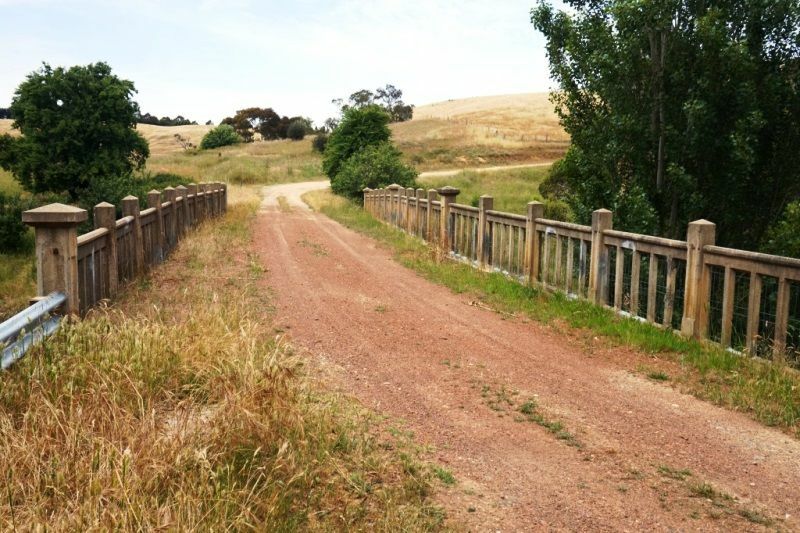 The bridge was first referred to as the "Memorial Bridge" in the August 5th 1919 edition of the Omeo Standard, which reported the opening on the 6th April 1921, where it was referred to as the "Soldiers' Memorial Bridge". The project was largely paid for by special grants from the Public Works Department and was built using shire day labour with the preferential employment of local returned servicemen. It is believed to be the first concrete bridge in the Shire of Omeo and resembles a road bridge with cast-in-place reinforced concrete T-girders and an integral flat slab deck. Note: The Victorian War Heritage Inventory states that the bridge was opened on the 6th April 1921 while the plaque at the bridge has the construction date as 1923. This sturdy concrete bridge was built in 1923 (sic) by unemployed returned servicemen. It honours those who died in action during World War 1. 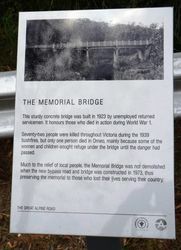 Seventy-two people were killed throughout Victoria during the 1939 bushfires, but only one person died in Omeo, mainly because some of the women and children sought refuge under the bridge until the danger had passed. Much to the relief of local people, the Memorial Bridge was not demolished when the new bypass and bridge were constructed in 1973, thus preserving the memorial to those who lost their lives serving their country.